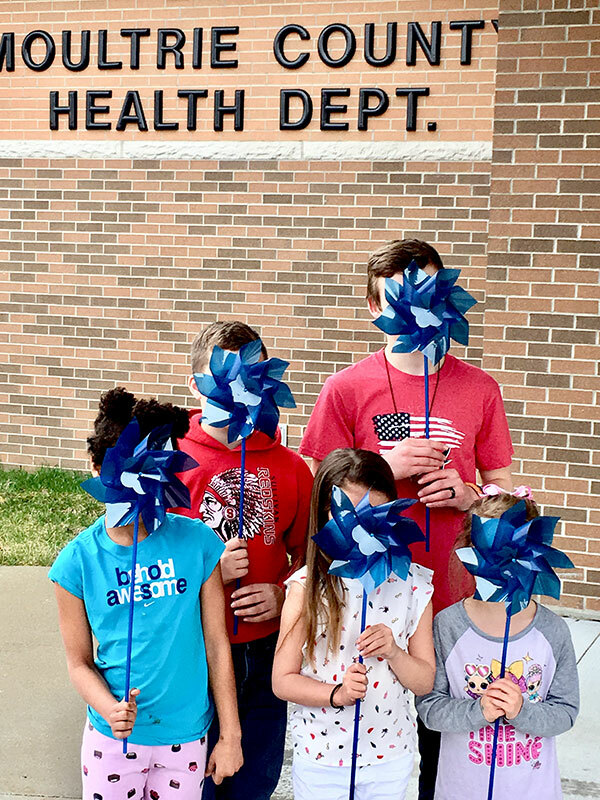 Blue Pinwheels are the theme for April at the Moultrie County Health Department (MCHD), and they symbolize more than just the windy spring days that typically dominate our central Illinois weather. Blue Pinwheels are also the symbol for National Child Abuse and Neglect Awareness Month. The pinwheels represent the whimsy, joy and innocence of childhood, which is often lost when child neglect and abuse occurs. Child neglect and abuse comes in many different forms and can be inflicted from a variety of sources and exposures. Anyone who is responsible for the care or well-being of a child under the age of 18 years is capable of committing intentional and unintentional actions that can cause physical, mental, emotional or even sexual abuse to a child. Though the abuse may not be immediately recognized, the damage caused by the abuse can last a lifetime. Teach children their rights. Discuss acceptable and unacceptable behavior with your children and keep an open-door in communication. Encourage your child to talk to you about his life and experiences on a daily basis. When children understand they are special and have right to feel safe and positive, they may be more likely to talk to someone they trust about things that make them uncomfortable. Examine your own behavior. Abuse isn’t just physical. Actions or failure to act can result in child abuse or neglect. Words can instill confidence or inflict pain. Use words carefully and wisely when speaking to a child. Be a positive role model. Consistently demonstrate behaviors that teach children that conflicts can be settled without harsh words or violence. Children watch and learn from us all of the time, whether we think they are watching or not. Discipline with self-discipline. Never discipline a child when you are upset. If a situation requires discipline, take a moment to de-stress, then return to address the child and situation when you can maintain control of your own emotions. Be a nurturing adult by remembering that the ultimate purpose of discipline is to teach (not hurt) a child. Many resources are available locally and online for additional guidance on effective parenting, including discipline strategies. Take time for yourself. Read a book. Have a hobby. Enjoy some time alone or in the company of adult friends. When caretakers take care of themselves too, the effects of stress and frustration are reduced. Volunteer your time. Help another parent or caretaker responsible for childcare. This can occur by offering to babysit or hosting a play date. In both situations, adults with childcare responsibilities can take a break and children can enjoy valuable playtime. Understand what child abuse is. Some forms of physical mistreatment are clearly child abuse. Neglect is another form of abuse that occurs when a parent or guardian fails to provide food, clothing or general care for their child. Emotional abuse can be inflicted by anyone, and happens when a child is berated, isolated or rejected. Know the signs of abuse. Unexplained injuries aren’t the only sign of abuse. Depression, fear, difficulty trusting others or making friends, sudden changes in eating or sleeping patterns, inappropriate sexual behavior, poor hygiene, hostility or secrecy are often signs of deeper emotional issues and may indicate problems or abuse. Report abuse. If you witness a child being harmed, see evidence of abuse, or if a child tells you about abuse, make a report to the Illinois Department of Children and Family Services at 1-800-25-ABUSE (252-2873) or the local police. Listen carefully when a child is talking about abuse and assure the child that she or he did the right thing by reaching out to a trusted adult. Support efforts that champion children and families. After-school activities, parent education classes, and respite care can help. Encourage local leaders to develop community-based programs and services to improve the lives of children and families. Ask employers to provide family-friendly work environments. Support laws which better protect children and improve their lives. For more information on the Moultrie County Health Department’s events and services, please visit www.moultriehealth.org and follow us on Facebook at www.facebook.com/moultriecountyhealth. To find out more about this movement, please visit www.childwelfare.gov/topics/preventing/preventionmonth/about/.